My vote is for sale. Cost? 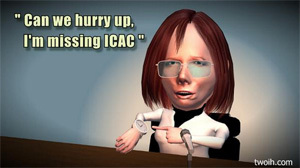 A Federal #ICAC. I admit it, even though I am in Queensland I LOVE #ICAC, it is the best show in town. It also frustrates me though, as I come from the land of #HereWeJohAgain and if any state needed an ICAC it is Queensland. The decimation of what the esteemed Mr Tony Fitzgerald set up all those years ago to safeguard our state from corruption has been poorly highlighted in the local press, we no longer have an effective Crime & Misconduct Commission, just a secretive little cadre of Government appointees. For a state that does not have an upper house, which means the winner takes all in Queensland politics, this is a terribly bad state of affairs. Effectively resulting in a dictatorship for whoever has the numbers in Parliament - and that is not hyperbole, just a fact of life - Queensland needs an ICAC! Queensland’s GasFields Commission (appointed by Campbell Newman) has members who financially benefit from the coal-seam gas industry. Backdating legislation to keep a donor out of trouble: BC 730: Karreman Quarries saved from prosecution by Deputy Premier Jeff Seeney who backdated changes to Queensland’s water act. Sibelco donating $91k to Newman election campaign & being rewarded by extension of mining lease. Changes to donation laws, upping from $1000 to $12,400 before a declaration is required to be lodged. Killing the Crime and Misconduct Commission (CMC) & replacing with an obedient CCC. Actually this list could go on forever if you think about it more than 5 mins. NOTE: Anyone interested in Queensland politics should follow David Marler @Qldaah who does a wonderful weekly wrap of #Qldpol shennanigans in his #QldWeekly column on nofibs.com.au. Now this is just one state, judging from tweets I see, we are not the lone ranger here in Queensland. Abuse of power, asset sales to political donors, political favours for so-called industry groups, lobbyist influence and more seems to be ‘business as usual’ all over the country. As we have seen with ICAC in NSW, state & federal politics always end up becoming entangled, therefore, maybe a Federal ICAC could help keep state corruption under control as well, particularly when some states - looking at you Queensland - are not inclined to be accountable? I know people say a Federal ICAC would be expensive, but bloody hell, just look at the money that has been blown on Pink Batts & Union Corruption Royal Commissions that are really just thinly veiled - hell damn near transparent - vendetta’s. If we have the cash for that, we have the cash to keep those decision makers accountable too. This is probably what concerns me most. WHY is this considered business as usual? Why is it that the IPA can have access to the PM and the likes of us Punters can’t? Why is the likes of a Brickworks company able to exert influence over national policy because of donations they made? You don’t have to be Einstein to see the correlation between pro Liberal news reporting combined with anti-ABC reporting resulting in cancellation of the Australia Network by this Government for it to be replaced weeks later by a “New Sky Channel”? I don’t know about you, but I am sick of this punter being on the bottom rung of the ladder of priorities for our elected representatives. I want ethical, honest politicians making policy decisions for the good of us, the electorate, not their donor mates. I am so over our taxpayer money being spent to subsidise party travel, I don’t care if Abbott’s cancer stop-over made his travel claim ‘technically’ legit under travel entitlement guidelines, to be quite frank, it is just taking the piss. I am sick of “business as usual”. 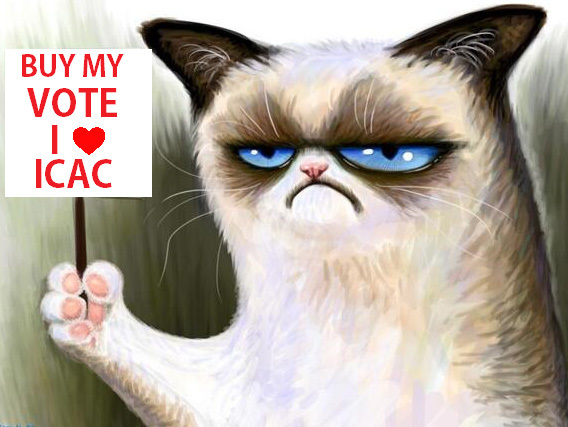 I Cranky Pants Noely, make this pledge, I will NOT vote for any candidate or party in future who will not agree to and abide by a Federal ICAC.